"A fabulous CD, worthy of its topic. when Judy Garland dominated American entertainment." FROM TENNESSEE TO OZ - The Amazing Saga of Judy Garland's Family History, Part 1. Visit apple itunes by CLICKING HERE for digital download! Special price this month! $8 incuding postage through September 10, 2015. Click here to purchase the revised "Made In America" with added instruments and show cast CD for $8.00, INCLUDING shipping & handling! Major credit is due the pianists, Sue Maskaleris... and Mark Hartman... As Ethel Merman first sang..., "who could ask for anything more?" 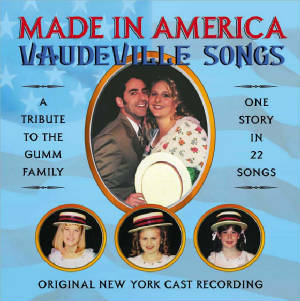 - 22 songs the Gumm Family performed in vaudeville! 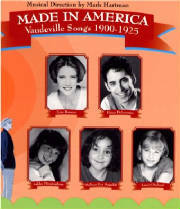 Our original Made In America CD, was a lovely work that is now nearly sold-out. The brilliant NEW "Made In America - A Tribute to the Gumm Family" has many changes and wonderful additions. Don't miss the fun! Put your order in now!!! PLEASE VISIT: MICHELLE'S BOOK NOOK for books, music, and costumes! "Made In America" is ... comprised of sterling talent,... Even if these old songs and the vaudeville cabaret style aren't your cup of tea, you're bound to find yourself getting caught up in it anyway." Come on and hear - Alexander's Ragtime Band! "...fine voices with sturdy piano backing evoke the innocent era when the Gumm family, the ebullient Frank Gumm, the intrepid Ethel Gumm, - sang across America with their daughters, the youngest of whom was the prodigy who became the great trouper, Judy Garland... CD contains actual documented songs sung by the vaudeville family. A great musical journey... I recommend it!" 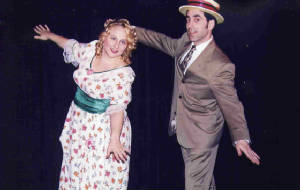 The Gumm Family in Vaudeville! Click Here!